Bethesda, MD-(ENEWSPF)- New research from the National Institutes of Health found that pairing the antidepressant amitriptyline with drugs designed to treat central nervous system diseases, enhances drug delivery to the brain by inhibiting the blood-brain barrier in rats. The blood-brain barrier serves as a natural, protective boundary, preventing most drugs from entering the brain. The research, performed in rats, appeared online April 27 in the Journal of Cerebral Blood Flow and Metabolism. Although researchers caution that more studies are needed to determine whether people will benefit from the discovery, the new finding has the potential to revolutionize treatment for a whole host of brain-centered conditions, including epilepsy, stroke,human amyotrophic lateral sclerosis (ALS), depression, and others. 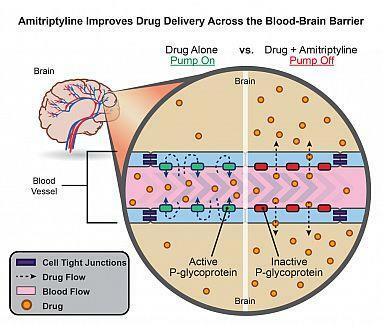 The results are so promising that a provisional patent application has been filed for methods of co-administration of amitriptyline with central nervous system drugs. NIEHS supports research to understand the effects of the environment on human health and is part of NIH. For more information on environmental health topics, visit www.niehs.nih.gov. Subscribe to one or more of the NIEHS news lists (www.niehs.nih.gov/news/releases/newslist/index.cfm) to stay current on NIEHS news, press releases, grant opportunities, training, events, and publications.